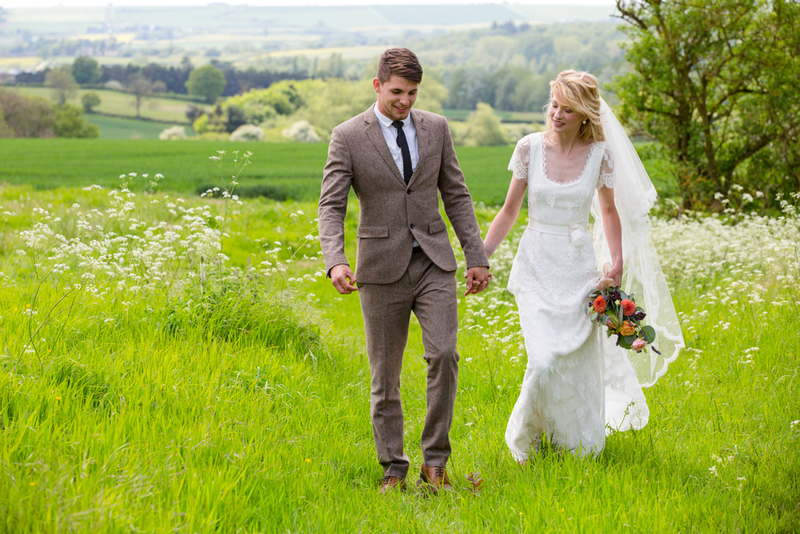 Mark is based in rural Oxfordshire & specialises in country weddings. He works regularly across the Chilterns, beautiful Berkshire downs & into the Cotswold countryside. 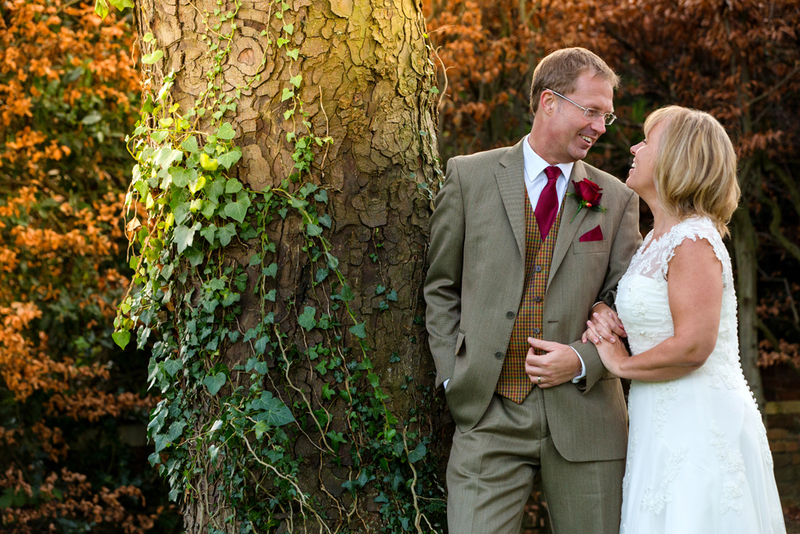 This area offers so many quintessentially English landscapes & Mark has a few favourite rural venues across his region that offer fantastic & fabulous country wedding locations for those who love the countryside. 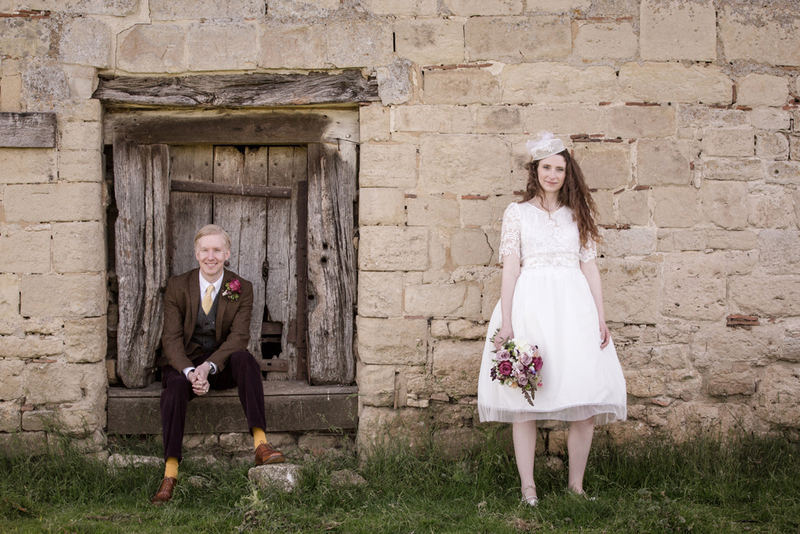 Mark has always worked very closely with The Tythe Barn, Launton & would highly recommend it as a venue for your country wedding. Will & Emma have lovingly restored the barn to a very high standard & they put this same level of dedication into every wedding. The barn is beautifully rustic with some wonderful design touches. 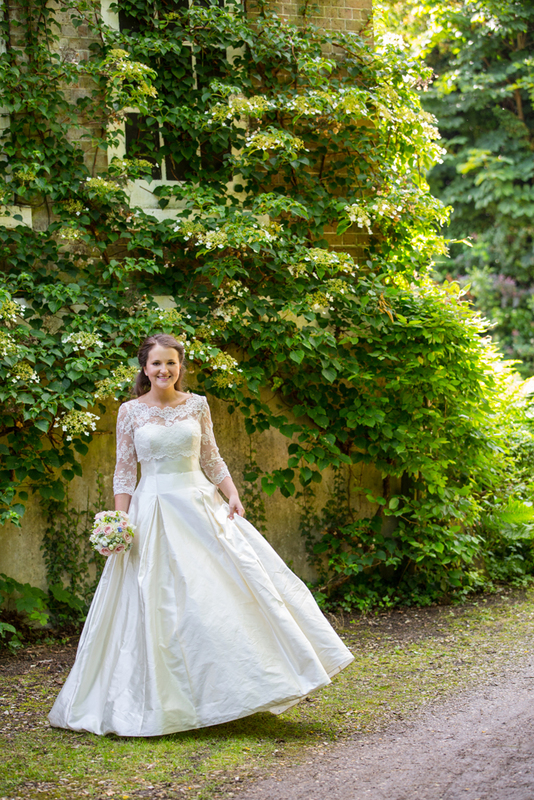 Mark has photographed weddings in Summer when the bride walks up an aisle which is an arbour of Wisteria in flower & Winter weddings when the barn is decked with twinkling white fairy lights. Other barns of note that Mark loves photographing weddings at are Luxters, Lains Barn, Notley Tythe Barn & Ufton Court Tythe Barn. 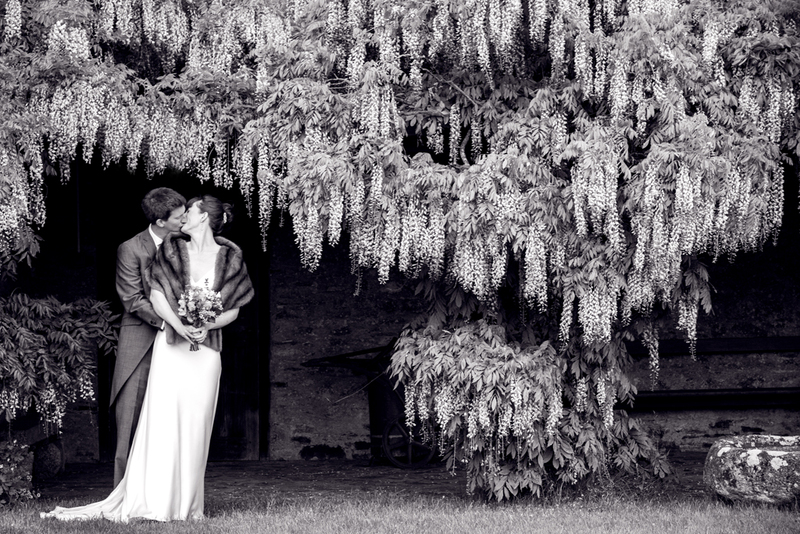 Early last summer Mark took part in a wedding photo shoot at the stunning Merriscourt between Burford & Chipping Norton. 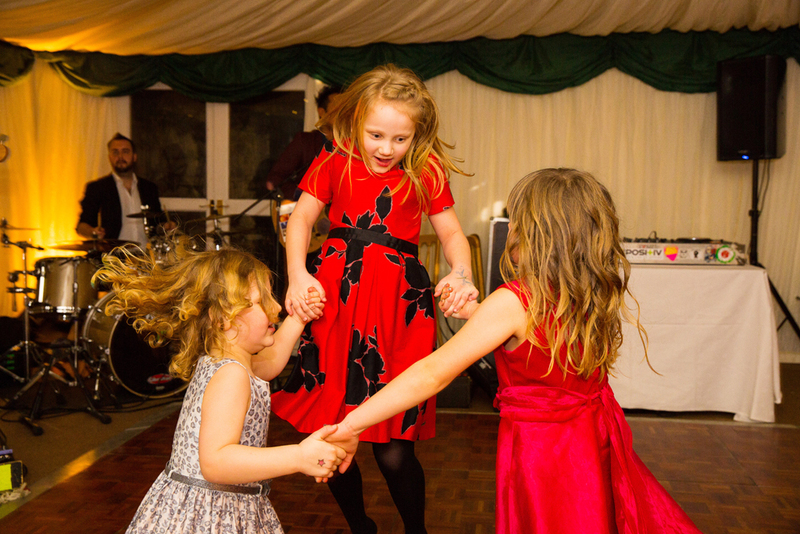 Merriscourt is a fantastic venue in a beautiful rural setting. It combines traditional Cotswold stone with bright stylish interiors. There are two fantastic barns that can be decorated completely to your taste, you can go for full blown vintage with bunting & floral china ware, shabby chic or go modern vintage with art deco glass & illuminated letters from Vowed & Amazed. If you are looking for a rural venue you can, of course, choose a stately home across this beautiful region & one of Mark’s favourites is the beautiful Hedsor House. Hedsor House is set within its own parkland above the river Thames & is only 25 miles from London. With beautiful, opulent décor it enables you to style your wedding your way. 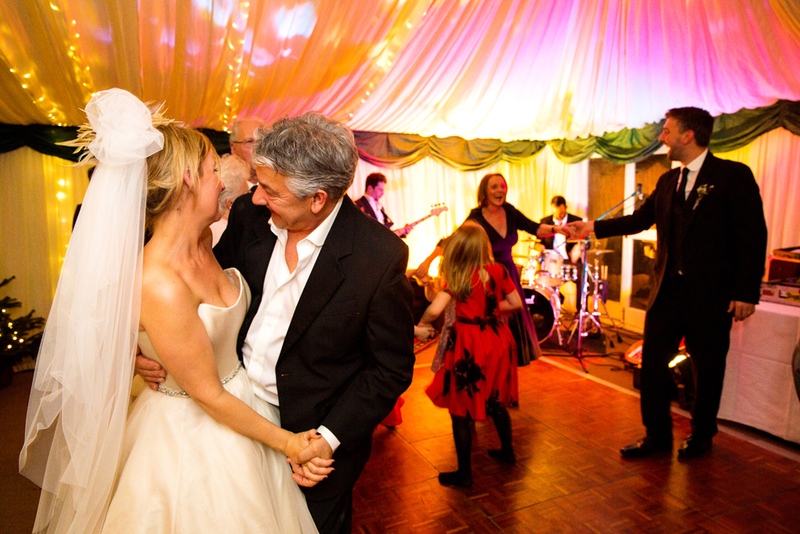 You can have your drinks reception in the stunning Centre Hall with its glazed dome & your reception in the oak panelled ballroom with beautiful views across the parkland. 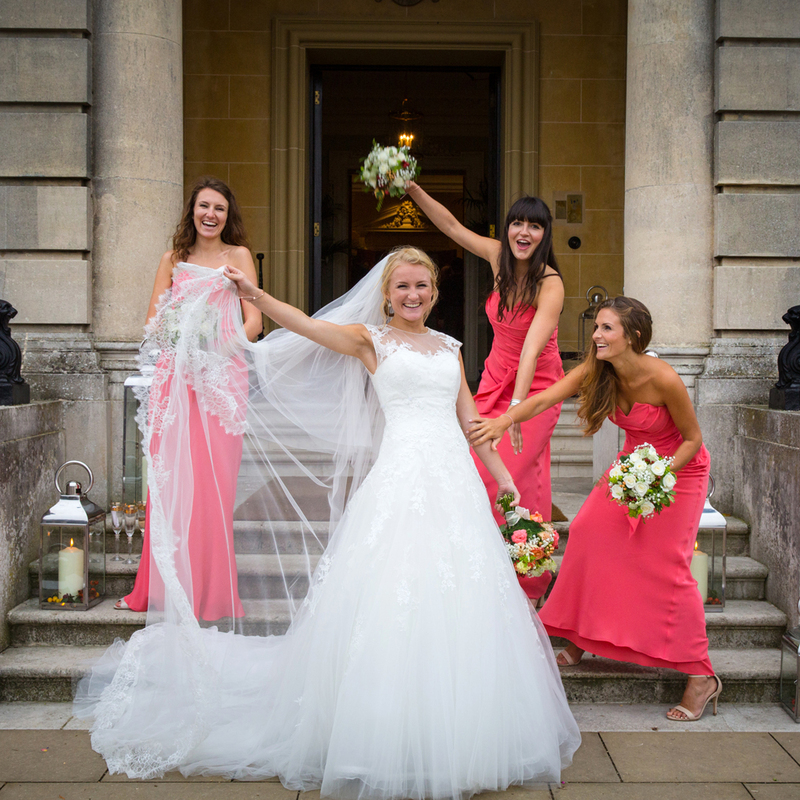 Hedsor House gives Mark an endless array of backdrops for stylish Bride & Groom images. 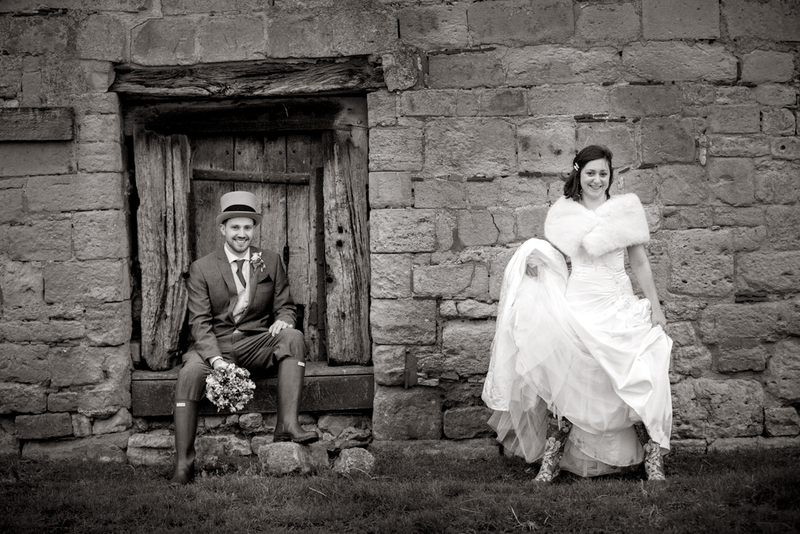 In particular he loves photographing the Bride & Groom with their wedding party on the steps. 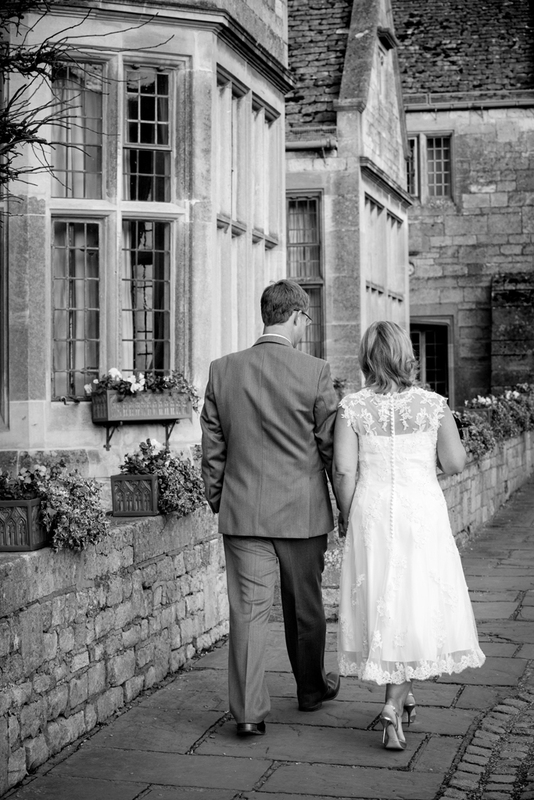 There are now so many beautiful country venues & wherever you choose to hold your country wedding Mark is simply the best photographer you could choose. 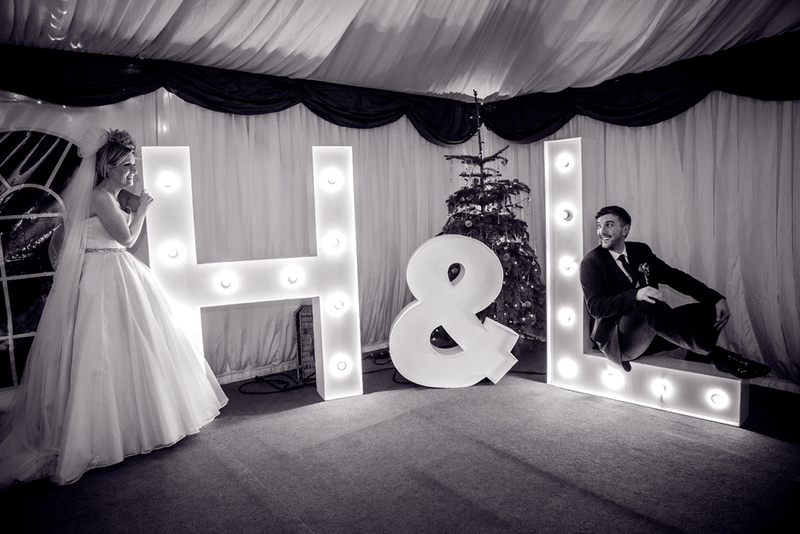 Between Christmas & New Year I photographed the wedding of Helen & Louis. We were greeted by another lovely wintery sunny day as we made our way to The Cotswold Plough in the quaint village of Clanfield, Oxfordshire. 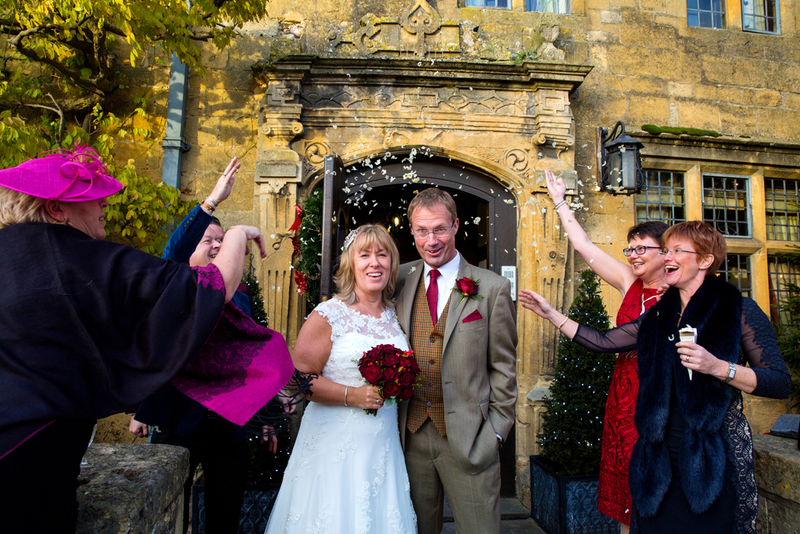 The Plough is a traditional 16th century Cotswold stone hotel & was a wonderfully cosy yet stylish location for a winter wedding. 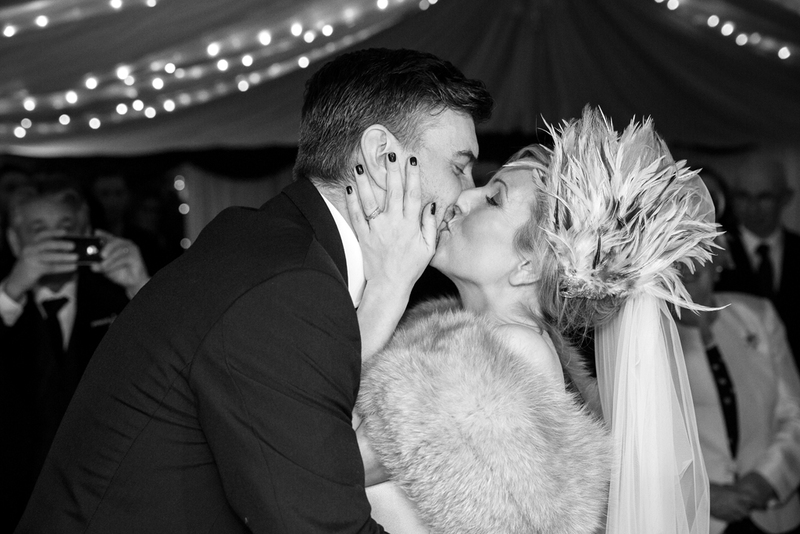 Helen & Louis’ day was a wonderful family affair with lots of stylish design ideas. 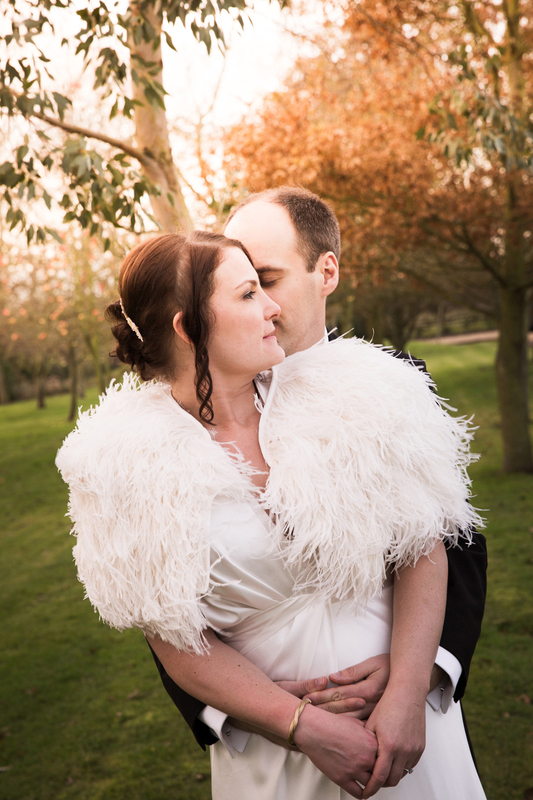 I thought the bride looked beautiful in her fur stole & pheasant feather headpiece that she made herself. 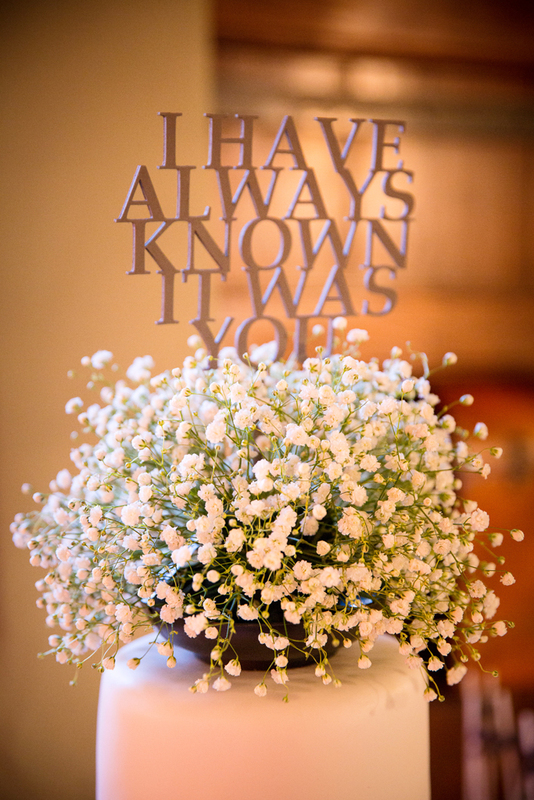 The use of gypsophila en masse in the bouquet & cake topper was stunning. So interesting to use these delicate little flowers so often used as incidental filler on its own & it looked beautiful – like floral clouds! It really was a lovely day & I think my images reflect this. As always I left everyone dancing the night away. Hope you enjoy your sneak peek Helen & Louis. Wishing you every happiness! Sam & Darren – A Sneak Peek! Shortly before Christmas I had the pleasure of photographing the wedding of Sam & Darren in the Cotswolds. It was a beautiful sunny winters day as Kiti & I headed to the picturesque village of Broadway. 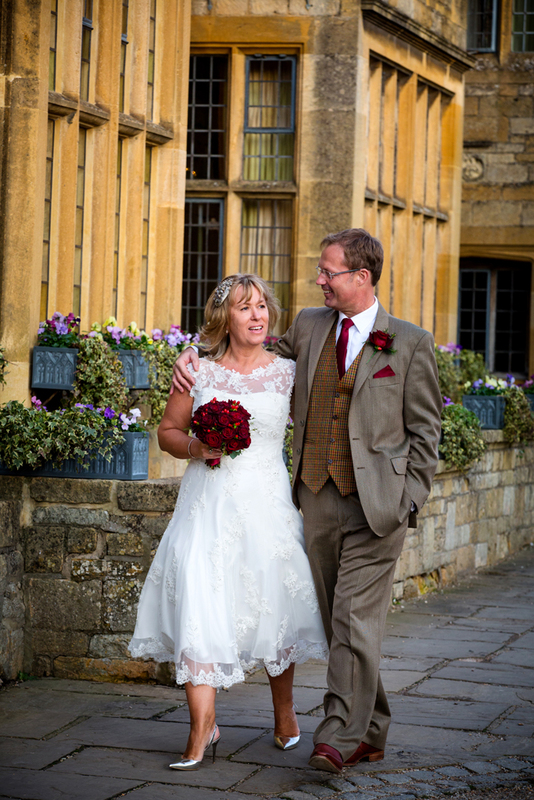 The wedding was held in the historical hotel The Lygon Arms. 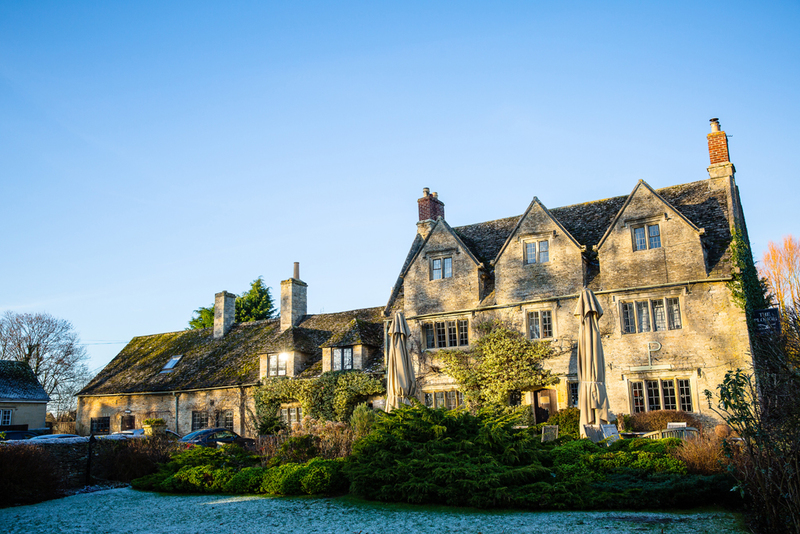 It is a beautiful building in honey-coloured Cotswold stone & looked wonderful in the sunshine. The first hotel on the site was documented in 1532. 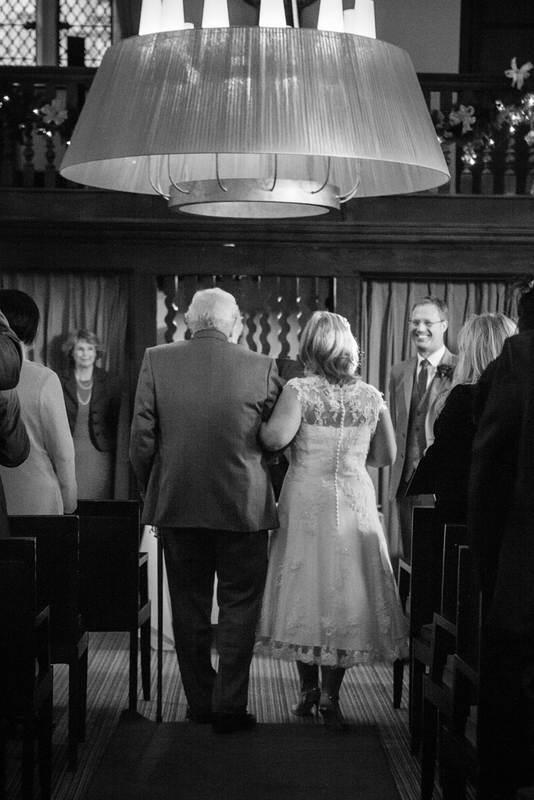 Their service was held in the wonderful Great Hall with the sunlight streaming through the windows & Sam was accompanied up the aisle by her very proud Dad. 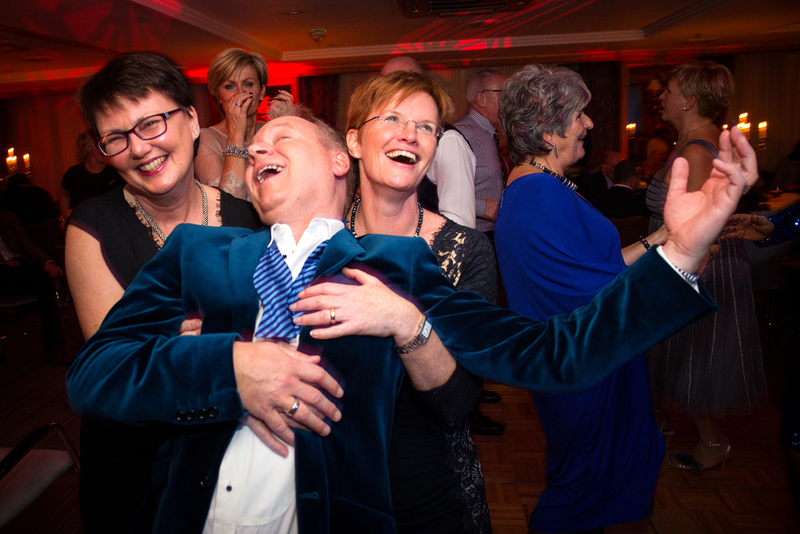 I love this image of Darren seeing his bride, I think his smile says it all…. It was a lovely wedding with inspiration from the season. 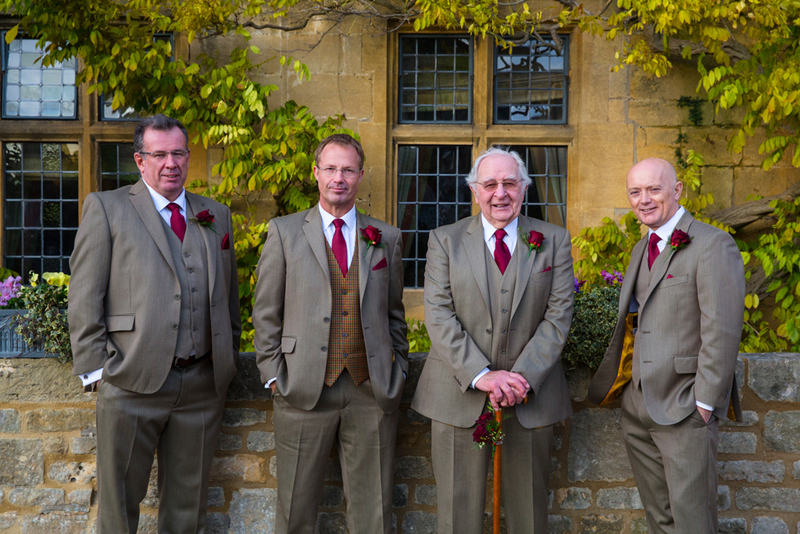 Darren & his groomsmen had stylish tweed suits accented by ruby red ties & pocket squares. Sam wore a gorgeous short dress with lace overlay & carried a beautiful bouquet of dark crimson roses. She also wore a fantastic pair of Jimmy Choos! 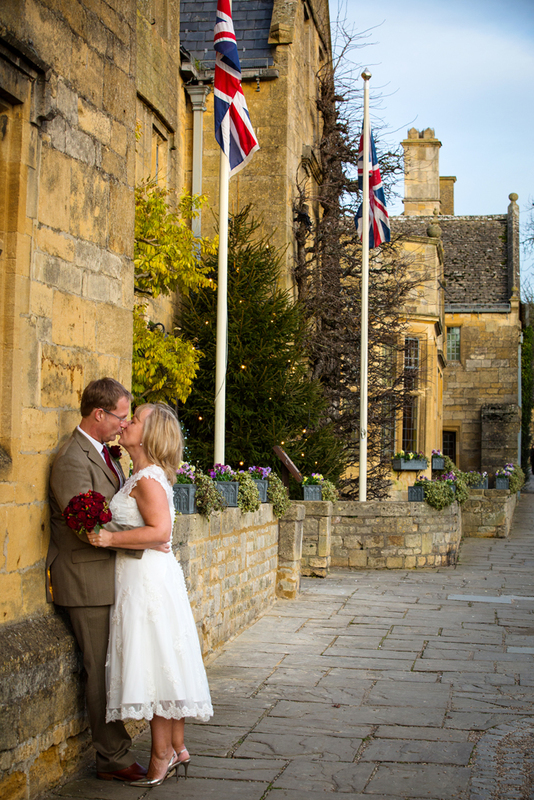 The Lygon Arms provided a stunning backdrop for the bride & groom photographs with the warm Cotswold stone frontage, Tudor timbers & a lovely garden. 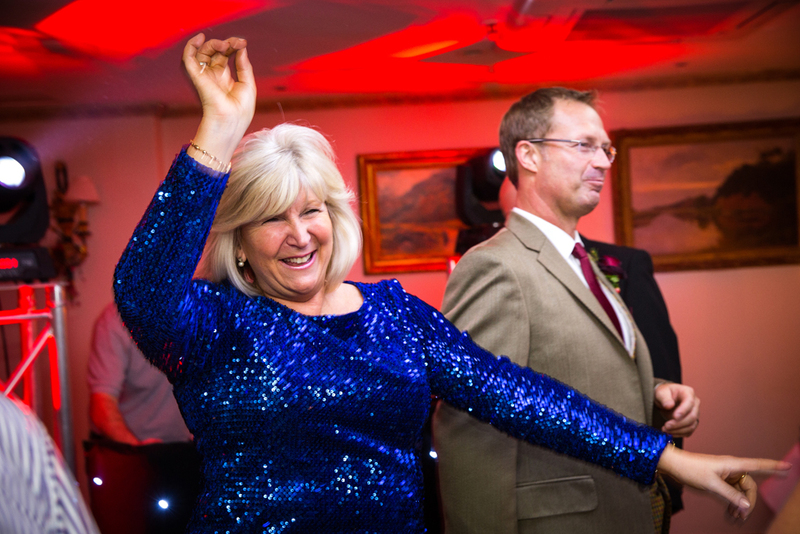 After a delicious dinner in the Great Hall Sam, Darren & their guests hit the dance floor. Its been a while since I saw such enthusiastic dancing!